What do you think are Alex Ovechkin's chances of breaking Wayne Gretzky's career goals record? Let's give 'er a go. Let's project Alex Ovechkin finishes with 51 goals this season. That would give him 270 career goals at age 24 following this regular season. 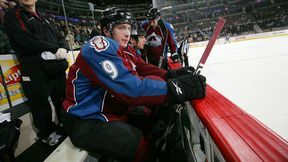 That means he would need 625 more goals to break Gretzky's all-time mark of 894. Because of Ovechkin's physical style of play, one would think he has a high probability of getting injured at some point. This would mean missed time and the potential of him being less of a player depending on the injury. Ovechkin's off-the-ice penchant for fast fun could also curtail his production over time. But let's hope for the best and assume Ovechkin escapes serious injury during his career and slowly adjusts as he gets older. Players who have booming shots age more slowly in terms of goal totals. We will attempt to project Ovechkin's goal total over the next 16 seasons through the age of 40, which was how old Brendan Shanahan (656 career goals) was when he retired. Brett Hull (741 goals) scored his last NHL goal at age 40. Wayne Gretzky scored his last at 38. Phil Esposito (717) was 38. Steve Yzerman (692) was 41. So 40 is a reasonable number. Some of Ovechkin's projected years might have unexplained lower goal totals in an attempt to compensate for some lost games like we saw this season, whether it be some kind of injury, slump or illness. Players who play like Ovechkin are not iron men. I will put his age and a projected goal total and see what we end up with. I don't really have a final total number in my mind. I'm just going to take it one season at a time starting with next season at age 25. I swear I didn't add as I went along. I think these numbers are pretty reasonable, as noted by some of the comparables. I do think Ovechkin will post a 70-goal season and I have it happening next season as all of this young Capitals talent keeps improving. Ovi just needs to keep shooting. OK, I will now add up my Ovechkin projected numbers to see what we have for a goal total over the next 16 seasons. If you combine those goals with the 270 we project Ovechkin to have after this season, he will easily breaks Gretzky's mark by 115 goals and would give him 1,009 career goals. This means we could even subtract seven goals from each of these projected seasons above and Ovechkin still has 897 goals at age 40. If you took off seven goals from each of the seasons above, Ovechkin could end up having no career 70-goal seasons, only one more 60-goal season and no more 50-goal seasons after the age of 27 and still break Gretzky's all-time mark. This will take a lot of health, hockey love and luck, but it's not far-fetched. Have you heard the rumor about the Ilitches (owners of the Red Wings) buying the Detroit Pistons and the Palace of Auburn Hills? If the Ilitches buy the Pistons, the Red Wings could move out to the Palace because the lease for the "Joe" is up. The Detroit Vipers (AHL) used to play at the Palace a few years ago. The Palace has more suites to offer and is in the suburbs of Detroit. The drawback is there isn't enough parking and/or hotels near by, but that could be fixed (stimulate that economy). The Wings needed a new arena 10 years ago. Joe Louis Arena is the equivalent of 1982 Chrysler K-car. I love the intimacy of The Joe and long for the days of smaller arenas, but it's time for a new home for Detroit. Imagine what kind of creativity and care could be put into a new cathedral for the Wings and Michigan hockey. I have not been to the Palace or the surrounding area to have an opinion on that. I would hope a new arena could be built downtown. I know things look bleak now, and in the immediate future, in Detroit. But there have been plenty of examples in which cities have come back strong over time. As I'm sure you know, Foppa and Naslund are playing for free. Pretty decent story, don't you think? I just watched Mark Eaton get railed in tonight's Pens/Sens game. The officials originally had called for icing, but dropped his arm. It appeared to me that Eaton thought there was still icing 'til just after he touched the puck, and was defenseless when he got pasted. Why do officials wave off icing when the puck is almost being touched by a defender? I have spoken out more for bigger nets (still believe in this) over the past decade than I have about the icing topic. But I believe the time has come for automatic icing. I don't have much to add here. Just do it. The evidence is overwhelming. There is simply no excuse not to. Come April, me and a few friends are joining a roller-hockey league, but are having a hard time thinking of a clever name for our team. We want something that is not totally ridiculous, but is also lighthearted and that we could make jerseys from. Do you have any suggestions? 1. Hakan and the Loobs: This is always the go-to name for a team from beer league to fantasy league. You could all have Loob on the back of your jerseys and have a cool scripted or block-lettered "LOOB" across your chest with a flame logo on one shoulder and a Swedish flag on the other. 2. The Knobs: For the self-deprecating types. 3. Sauce: This word, used to describe a sick pass of the saucer variety, is quickly becoming the finest word to describe a hockey moment. "Alexander Semin with some sick sauce to Mike Knuble for the goal!" I can't think of a more current hockey jersey you could construct than to have the word "SAUCE" across your chest. If Panger can go up to Sheryl Crow and strike up a conversation, I'm pretty sure I can go talk to the cute girl that's at trivia every Thursday and see if she wants to get dinner sometime. Pang has the power to instill confidence with all that he does. There was a time when Darren Pang, his name and his game, hijacked this column. I love Panger. Panger and I used to go to Denny's after a late "NHL 2Night" and draw up Olympic teams on the place mats. I was so obsessed with his name, eventually a library of "Pangerisms" was constructed for this space. From "Caddyshack:" "Hey PANG, it's a parking lot!" Podes is helping coach part time the St. Louis Park boys' high school hockey team. SLP is a suburb next to Minneapolis. Podes has been absolutely great for these kids. He brings an incredible amount of energy and the kids respond to him like I have never seen before. He preaches having fun above everything else, but the kids really listen and take to heart the technical coaching he gives them. When Podes is on the ice for practice about once a week, the kids work harder. It almost like they don't want to disappoint him. The man has 10 years of NHL experience and yet he doesn't act like he is any better than the varsity and JV hockey players. Shjon has no family ties to the hockey team, he donates his time simply because he likes to be around the kids and he likes to be around the game. He is a really great guy and we are very lucky to have him in the St. Louis Park community. Shjon Podein's blood type: Awesomeness. Given how horrible the Penguins' power play is, do you think they still have a chance to repeat? The Penguins' power play should settle into that 18-20 percent area. They do lack a front-of-the-net presence and a true sniping finisher outside of Evgeni Malkin. Sergei Gonchar missing 16 games also hurt the unit; he is one of the best power-play defensemen in the NHL. Also, come playoff time, I think you will find Sidney Crosby around the net more. To have him take a beating down by the net during the long regular season doesn't make too much sense. Just a quick story about my son Joe, who has only been skating for 1½ years and is a first-year Squirt. A month and a half ago, he was up all night worshiping the porcelain goddess and at about 2 in the morning, I told him there was no way he was going to be able to play in his game at 8 a.m. He looked at me while on his knees and asked me when we would have to leave if he could play. I told him 6 a.m. as the rink we were to play on was an hour away and he told me to wake him. I woke him up, and he told me he could play, so with great trepidation I took him to the rink. His coach looked at him and asked him why he was there after being sick all night, and he told him, "Coach, we only have 11 kids on the team and Chris is out of town and I did not want let the rest of the team down." He promptly scored the team's first goal and they won. He slept all the way home, I carried him to the house, where he slept until I had to wake him up to take him to his second game at noon, where he scored the game-winning goal. Allowing Joe to play hockey this year has changed his life. He used to have major anxiety problems and struggled at school. This year, his anxiety is no longer is debilitating and his grades are above average. 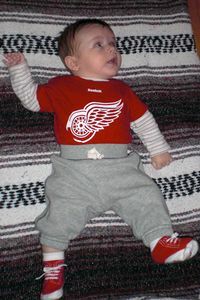 My first born, Francesco, is already a big Wings fan. He loves watching their games. I'm a little nervous that the Wings might not make the playoffs in his first year of his life, but he told me that they'll make it! I've been meaning to send in a picture of our backyard "pond." 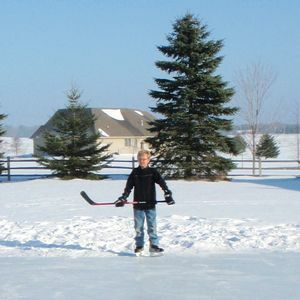 Here's a photo of my son Nick on Christmas morning (he plays for Belle Tire 99 AAA here in Mich.). 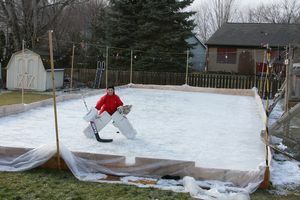 He couldn't wait to test out the new pads. (Note the ladder in the background to retrieve all of the errant shots from the neighbor's yard.) We had our own version of the Winter Classic this year with about a dozen of his friends playing 3-on-3 games. Is it strange that a highlight of my day is the midnight resurfacing? Robert S. Donofrio M.S., Ph.D. I wanted to share a picture of our 18-month-old daughter wearing her favorite Christmas present. I didn't know what I'd do with a girl, but she's off to a great start. 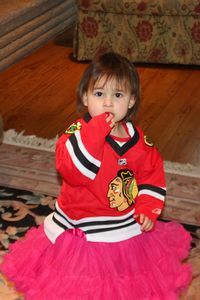 Hopefully she won't have to wait as long as I have to see the Hawks win the Cup!